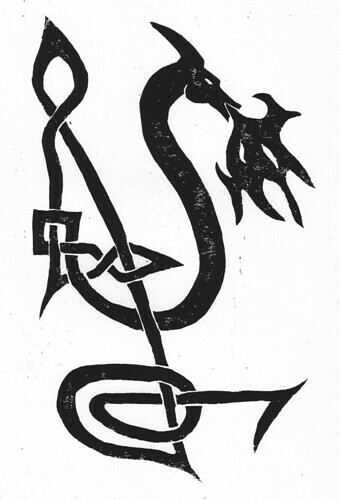 This is another version of the same dragon – I resized a cleaned-up version of the black & white outline I did, printed it out onto some parchment-textured paper I found in my stash, and then inked it. 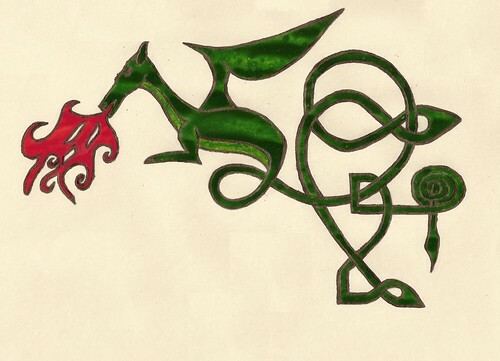 Literally inked, that is – the green & red are calligraphy ink, applied with a pen, but the bronze outlining is acrylic paint. This is the first stage of an attempt to illustrate the firework dragon Gandalf conjures for Bilbo’s Party at the beginning of The Fellowship of the Ring. I was inspired by these posts on Tor.com, where Kate Nepveu is blogging her Lord of the Rings re-read. I’m going to colour it, but I wanted to post the black and white version first. 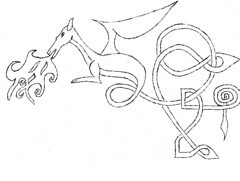 Wikipedia on Insular art – the fusion of Viking/Celtic knotwork, Germanic animal-style, and Christianity. I need to try some of this.